Safety valves are an indispensable part of today’s security technology. In contrast to rupture disks, they have the advantage to be able to blow off and close several times. Experience suggests that chatter can occur during blowing off. Chatter is a high frequency, oscillating upward and downward movement of the valve disc, which affects the reliable operation of the valve. A chattering valve can no longer reliably dissipate and destroys itself in worst case. In this project, the flow phenomena within a safety valve which can cause chatter are firstly elaborated by a static and a dynamic model. Secondly, the existing criteria to avoid chatter are investigated through a critical literature review, taking into account the previously determined flow phenomena. It turns out that the the use of the criteria for safe avoidance of chatter is very questionable. 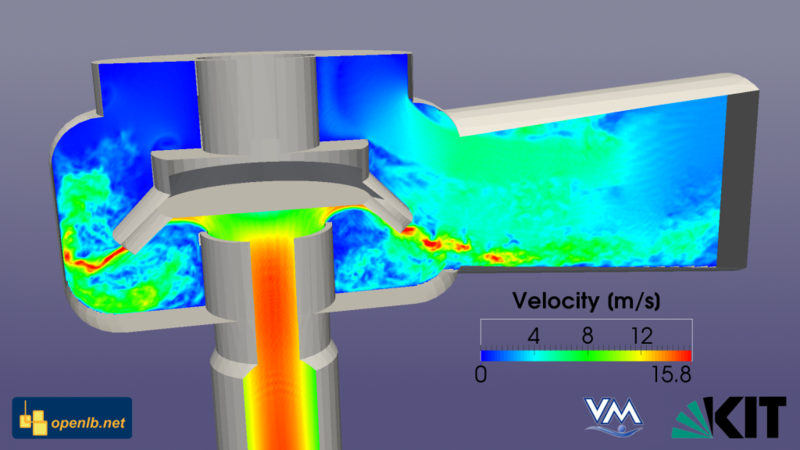 The final fluid flow simulation of a safety valve with water flow is based on Lattice Boltzmann Methods and performed with OpenLB. This has the advantage that unsteady flows are efficiently computable by paralellized calculations on high performance computers. In order to simulate the dynamic opening with all the effects that occur in future work, the turbulent flow through a safety valve was validated. Finally, the forces acting on different disk geometries could be calculated and thus the influence of disk geometry on the opening is shown. P. Nathen, D. Gaudlitz, M. J. Krause, J. Kratzke: An extension of the Lattice Boltzmann Method for simulating turbulent flows around rotating geometries of arbitrary shape, 21st AIAA Computational Fluid Dynamics Conference. American Institute of Aeronautics and Astronautics, 2013. J. Fietz et al. : Optimized hybrid parallel lattice Boltzmann fluid flow simulations on complex geometries, Euro-Par 2012 Parallel Processing. Springer Berlin Heidelberg, 818-829, 2012. Contributed by Andreas Schleich and Mathias J. Krause.